A course about claiming your freedom. Cool. Many people want to be free (but some don’t want to be free, because being really free is scary to them). If you are on this website you are probably interested in regaining your freedom. You do know that claiming your freedom requires a higher degree of personal responsibility than ever before? 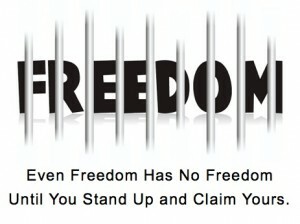 Freedom comes at the cost of being responsible, liable and having integrity. Are you ready? Join us for an online course to address some of the core ideas and issues facing people from around the world when it comes to seeking their personal freedom from outside control. We will cover some powerful principles of human psychology, law, history, propaganda, the power of ideas and the steps you can take to reclaim your freedom. A shift isn’t coming….its HERE. Be a part of the process and help it along. Your energy, passion, dreams and spirit WILL make a difference. Join up for the the course here (you must be a member of private-person.com to enroll). Peace, freedom, and success to you and yours (pass it on!). Yes, — responsibility is yours to protect your rights. No one can do it for you, not your mom, dad or government. Anyone at anytime can try to bully you into giving up, or waiving your rights. Any right. Your right to work, live or move about. Only you can say no. But you know saying no is not enough, especially in these times. After you say no, often they will keep rolling over you. Not because they should, or that they are legally entitled to but because you don’t know what to do against their pressure and persistence, or maybe you are too afraid. Only when enough people say no, lawfully claim or legally complain properly to reset the standard of behaviour by those claims and complaints about any unlawful or illegal actions, will things change for the better. Welcome to the next step in standing up and taking back your power. You must speak up and say no. You must be prepared to stay standing and be prepared to speak to the matters on your own. “They” are bound by the law, it’s our job to hold them to their laws, by complaining through lawful processes. NOTE: The FBI is the US lead federal agency for investigating color of law abuses, which include acts carried out by government officials operating both within and beyond the limits of their lawful authority. Off-duty conduct may be covered if the perpetrator asserted his or her official status in some way. if you are enrolled for the H4J-1 Course there is a support ticket system on that site. You need to be enrolled in H4J-1 first to access others. Hello! I have no idea how to donate or put in a support ticket. I’d like to gain access to the 2nd and 3rd courses. Very interesting and makes sense as a useful step. If you would like to tell your story I’d be happy to host you on a webinar or do an interview. Do I have access to this through Suewrongdoers?